This remedy does work. Thank you to Paulkrebaum for this valuable information that was taken from his website. for very large pets one quart of tepid tap water may be added to enable complete coverage. Wash pet promptly and thoroughly, work the solution deep into the fur. Let your nose guide you, leave the solution on about 5 minutes or until the odor is gone. Some heavily oiled areas may require a “rinse and repeat” washing. 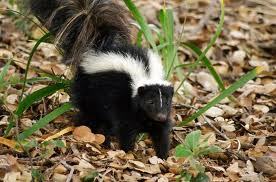 Skunks usually aim for the face, but try to keep the solution out of the eyes – it stings. If you have any cuts on your hands you might want to wear latex gloves for the same reason. After treatment, thoroughly rinse your pet with tepid tap water. Pour the spent solution down the drain with running water. NEVER, ever, store mixed solution in a closed bottle, sprayer,etc. Pressure will build up until the container bursts. This can cause severe injury. 1) Clean plastic mixing containers and utensils are preferred. Metals encourage auto-decomposition of the peroxide. 2) Hydrogen Peroxide 3% solution is usually sold in pint (500ml) bottles, so you’ll need two. The 3% grade is often marked “U.S.P.”, meaning that it meets the standards for medical use and purity as set forth in the United States Pharmacopoeia. The use of other strengths/grades is not recommended unless you’re a chemist, and even then a trip to the 24-hour drugstore is much better than a trip to the emergency room. 3) Use baking soda, not baking powder. “Arm and Hammer” is one popular brand. Baking soda is also called: Sodium Bicarbonate, Sodium Bicarbonate, U.S.P., Bicarbonate of Soda, and Sodium Hydrogen Carbonate. Do not confuse any of the above with Washing Soda, which is Sodium Carbonate. Washing Soda is about 100 times more alkaline than Baking Soda and can cause skin burns to both you and your pet. 4) Two preferred brands are “Softsoap” and “Ivory Liquid”. As far as auto-decomposition of the peroxide is concerned, the surfactant package in these two is fairly inert. Heavy-duty grease-cutting brands such as “Dawn” are less inert, and hair shampoo is probably the worst. 5) Once mixed, the peroxide slowly breaks down into water and oxygen gas. Thus it gets weaker with time and so it should be used promptly. The exact rate depends on temperature, pH, and catalysts such as trace amounts of metals (iron,etc.) in the soap and/or tap water. Look for an expiration date on your peroxide. If you’re using stuff which has been sitting around in your medicine cabinet for years, buy fresh peroxide. 7) All brand names mentioned in this website are trademarks of their various owners.